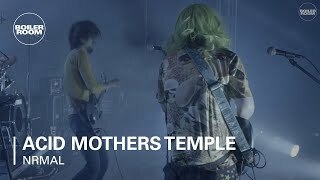 The sprawling universe of that is Acid Mothers Temple was formed in 1995 by Kawabata Makoto. Originally titled the 'Acid Mothers Temple soul-collective and encompassing musicians, dancers, artists, farmers, channellers, ex-yakuza, mermaid researchers and professional vagrants', the collective has always had at its core a dedication to improvised music. Now with a history of over two decades, and a discography of over one hundred releases, which is not to mention the numerous solo and side-project releases which encompass everything from drone, acid-folk, acapella, to minimalist composition, the group show no signs of relenting in the pace of their creative energy.